Nitro Games refines its formula, with a twist. 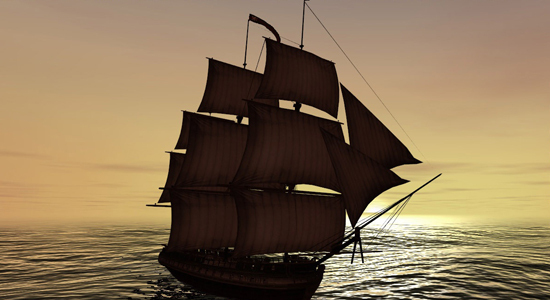 ommerce, pursuit, and plunder on the high seas — why should the state have all the fun? In Privateer, expansion to East India Company, players command fleets beholden only to the peculiar, martial entrepreneurship of the early Enlightenment, building a fortune by trade or exacting one from the enemy named in a letter of marque. Nitro Games appends its competent original release not only with new features and gameplay, but also several critical revisions to East India Company's interface, leaving it structurally impeccable. Ports are no longer rendered in 3D graphics, nor do players need endure loading screens to begin making deals landside — a dialog window instantly opens and the game continues, the savings in time a fair swap for immersion. All available goods indicate the most profitable market for sale, obviating the original game's frustrating entrance and exit of dialog windows necessary to learn who in the world is buying what. Maintenance tasks, like refitting battle-damaged ships, can be set to automatic completion when fleets arrive in ports of call. Nitro has made several critical revisions to the interface, leaving it structurally impeccable.What are privateers to do? Amass wealth and prestige. Normal routines of transoceanic trade — tea, silk, and spices remain popular as ever — are enlivened by dozens of missions offered by European powers. Players can accept two types: merchant or privateer. Many merchant missions, such as hauling goods between two points, pose zero risk as well as easy opportunities for ingratiation with one country or the other. Still more involve smuggling from a rival's port, which can result in being fined and banned for months, but, if pulled off, pay munificently. Privateer missions are reserved for those firmly established in the profession, as all carry the potential for naval combat, and players can only build warships in ports whose rulers think highly of them. Specialists, hired from any friendly port, facilitate more delicate line items in the privateer's job description: one increases the chance of surreptitiously accessing an unfriendly port, another aids smuggling, and others contribute bonuses to ships' lethality or sturdiness. Meticulous players will find that combining these with commanders' talents adapts fleets to singular purposes. Players for whom monetary gain and assembling a squadron of renegade sails aren't reward enough could find the open-ended campaigns (two twenty-year-long blocks and a third, "sandbox" voyage for profit) a little aimless. But Nitro Games' formula — refined, and with a twist — isn't any less of a tonic for real-time strategy.